An American pastor held for two years in Turkey on terror-related charges arrived home in the United States on Saturday and sat down with President Donald Trump, who signaled an easing in the diplomatic crisis sparked by the case. Andrew Brunson received a hero’s welcome at the White House shortly after his arrival at Joint Base Andrews outside Washington. 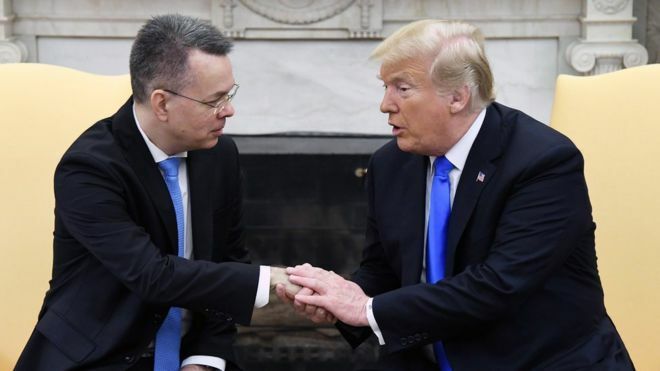 Brunson thanked Trump and his administration, saying “you really fought for us” and later kneeled to pray for the president, his hand on Trump’s shoulder. Trump repeatedly thanked Turkish President Recep Tayyip Erdogan for his help on the case, which caused not only a serious diplomatic row between the NATO allies but led to a crash in the lira, exposing Turkey’s economic fragility.